In 2010, the Center City District began working in partnership with the community-based Friends of the Rail Park [formerly known as Reading Viaduct Project], the City’s Commerce Department, and the Department of Parks & Recreation to evaluate the options for the abandoned viaduct that runs north in two segments: from Vine Street to 13th and Noble streets to the west; and to the 800 block of Fairmount Avenue to the east. In 2011, based on these conclusions, and with further generous contributions of $75,000 from the William Penn Foundation and $25,000 from Poor Richard’s Charitable Trust, the Center City District commissioned a concept and schematic design study, which was conducted by Urban Engineers and Studio| Bryan Hanes. The study, which focused on the SEPTA-owned spur only, was prepared in partnership with community stakeholders and the Philadelphia Department of Commerce and Department of Parks & Recreation. It began with a neighborhood meeting in fall 2011 to discuss community preferences and aspirations for the viaduct. In January 2012, the design team presented multiple design options at a community meeting with residents, property owners, and businesses from the area. Following the meeting, an online survey was conducted in which more than 50 participants expressed their preferences and provided extensive comments. The community participants strongly favored making the park an informal, leafy green space with plenty of grass and flowering plants, and with room to walk and sit. They wanted the park to maintain the industrial authenticity of its origins, while still meeting modern safety, code and access requirements. Construction began on October 31, 2016 with funding from an enormous range of friends and supporters, including: the Commonwealth of Pennsylvania, the City of Philadelphia, the William Penn Foundation, the Knight Foundation, Poor Richard’s Charitable Trust, The McLean Contributionship, a host of individuals and the Friends of the Rail Park. 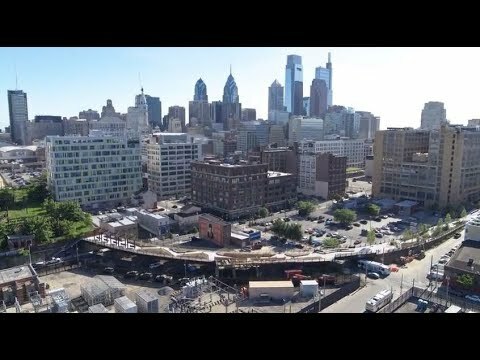 On June 14, 2018, the Rail Park opened to the public with a festive ribbon-cutting event attended by city and state officials, community leaders, philanthropic organizations, and hundreds of Philadelphia residents. City and state officials, philanthropic organizations, cultural and business leaders, neighbors and civic groups joined CCD President and CEO Paul R. Levy and members of the public for a ribbon cutting ceremony to celebrate the official opening of Phase 1 of the Rail Park.